Just because your kitty has a sensitive stomach doesn’t mean you have to sacrifice quality in the search for a Limited Ingredient Diet. With this MedalSeries Whole-Prey Limited Ingredient Diet, turkey is the single animal protein source so your cat can received the highest quality nutrition, while also enjoying a more simplified diet. 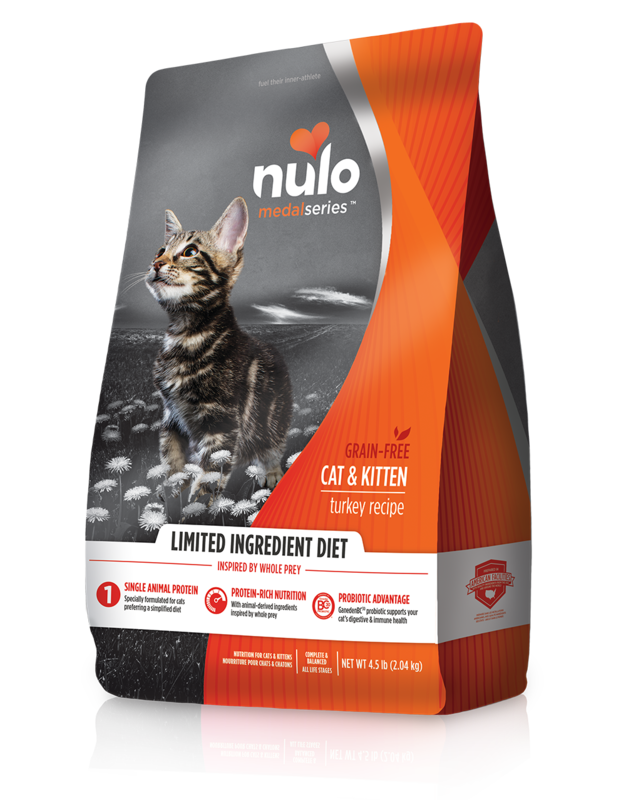 Paired with nutrient-rich organ meats like Turkey Hearts and Turkey Liver and collagen-rich Turkey Necks, this unique recipe will satisfy your cat’s appetite and give them benefit of whole-prey ingredients — as nature intended. Deboned Turkey, Turkey Meal, Yellow Peas, Green Lentils, Canola Oil (preserved with Mixed Tocopherols & Citric Acid), Turkey Necks, Whole Flaxseed, Miscanthus Grass, Turkey Liver, Turkey Hearts, Natural Turkey Flavor, Salmon Oil, DL-Methionine, Dried Chicory Root, Dried Cranberries, Dried Kelp, Dried Sweet Potatoes, Calcium Carbonate, Taurine, Potassium Chloride, Yucca Schidigera Extract, Choline Chloride, Zinc Proteinate, Vitamin E Supplement, Zinc Sulfate, L-Ascorbyl-2-Polyphosphate (source of Vitamin C), Iron Proteinate, Niacin Supplement, Ferrous Sulfate, Copper Proteinate, Copper Sulfate, Vitamin A Supplement, Manganese Proteinate, Thiamine Mononitrate, Calcium Pantothenate, Riboflavin Supplement, Pyridoxine Hydrochloride, Manganous Oxide, Biotin, Dried Bacillus coagulans Fermentation Product, Vitamin B12 Supplement, Vitamin D3 Supplement, Folic Acid, Sodium Selenite, Calcium Iodate, Rosemary Extract. MedalSeries Limited Ingredient Cat & Kitten Turkey Recipe is formulated to meet the nutritional levels established by the AAFCO Cat Food Nutrient Profiles for all lifestages.